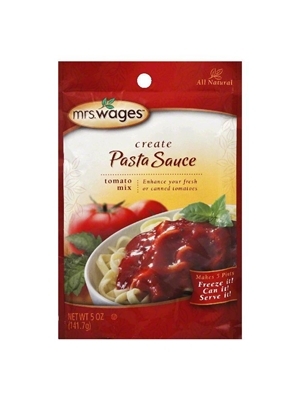 Mrs. Wages Create Pasta Sauce is a top selling brand of the fast growing tomato sauce mix category of the home canning market. Use this mix, containing just the right spices with fresh or canned tomatoes, or tomato paste, for a spectacular sauce. Makes 5 pints. Ready to eat in 24 hours after preparation. 5oz. Food Starch, Salt, Dehydrated Onion, Maltodextrin, Spice, Dehydrated Garlic, Paprika, Citric Acid, Soybean Oil.